Young First Nations people in Manitoba tackle their number one problem – suicide among their peers. I interview First Nations activists to learn more about this trailblazing approach. 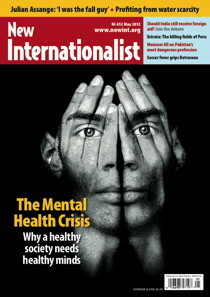 For the full article, see the May 2012 issue of New Internationalist magazine. This entry was posted on April 21, 2012 at 2:40 am and is filed under News Articles. You can follow any responses to this entry through the RSS 2.0 feed. You can leave a response, or trackback from your own site.